In the late 19th Century there was probably few Maine Guides that could match the Rangeley Region’s Ed Grant in his ability to “spin a good yarn”. 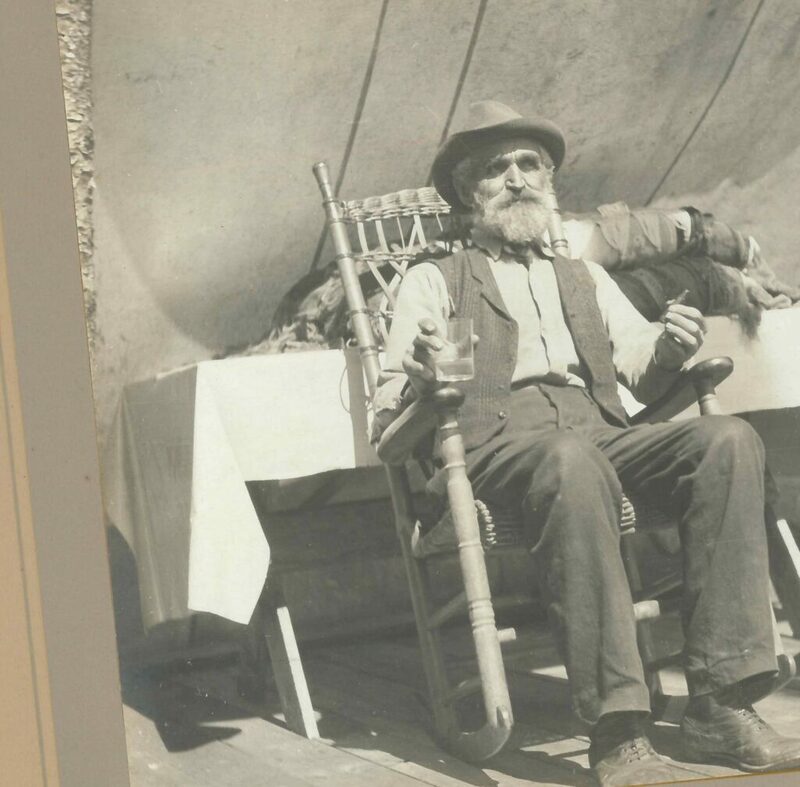 He was the founder of Grant’s Camps, which still in operation today at Kennebago Lake. Ed was known as the “Sage of Beaver Pond Camp”and was as superb a storyteller as any Maine Guide who ever lived. Some of his stories were chronicled by a regular guest, Francis I. Maule of Philadelphia, in a small book titled; “The Tame Trout and Other Backwoods Fairy Tales” published by Maine Woods and Woodsman Print in 1904. The story was reprinted in 1939 by the Grabhorn Press as a little 8-page booklet that was given away to friends as a New Year’s gift from Francis and Marjory Farquar of Berkeley, CA. who were also guests of Ed’s. The original publications were limited prints and are hard to find, but reprints are available online. The 1904 edition included entertaining stories like “Grant’s Partridge”,“A Remarkable Bear Skin”, “Rowing Extraordinary” and “The New Camp Stove”. The article below with quotes from Ed (most likely to Fly Rod Crosby) for the June 6, 1900 edition of the Phillips Phonograph share Ed’s ability to “add color” to even a simple report from camp. The 2nd short article, from the same edition, shares another Mooselookmeguntic guide’s idea of “Rowing Extraordinary”. Can you imagine what the Spring fishing in Maine was like in 1900! Enjoy and Be sure to get out and make some Outdoor History of your own! Your correspondent this morning met “Eddie” Grant who is home for a day or two from Seven Ponds. He said that the travel this year commenced earlier than usual, and they are now working to finish a new camp for Mr. C. M. Hapgood’s party of Easton, Pa., who are coming the middle of this month for a stay of six or eight weeks. The buckboard road now makes the Seven Ponds camps (Megantic); only half a day’s journey from Kennebago, and more people are coming than ever before. The Vaughn party of Worcester, Mass., five in number, with Jim Mathieson, Jim Stewart and John Oakes for guides, went in on Monday. A. Stearns and son, John Ballard and son of Boston, who have been coming for years, are now in camp for a two weeks’ stay. Think of daily mails way up at Ed Grant’s camp! But they have them, and everyone who goes to Seven Ponds, is happy and sure to want to stay all summer. (And in the same issue this little missive that shares one guide’s theory that salmon like their flies trolled faster which is still true today). A well-known resident of Springfield, Mass., who has already made one fishing trip to the Rangeley lakes this spring, was out trolling a few days ago when he discovered that his sinkers were riding up on top of the water, the result of the very fast rowing that the guide was indulging in. The sportsman naturally moderated and suggested that for the sake of landing a salmon, once in a while, would he be willing to row considerably slower?